We recently hosted a bridal shower at dk Gallery, a fabulous contemporary fine art gallery on the Marietta Square that just so happens to be owned by one of my dearest girlfriends who was also a co-host of the shower. Everything turned out perfectly—a beautiful night, a beautiful location and a beautiful bride-to-be. We spent two days preparing the food for the shower and I’ve decided that unless I someday have the space for a commercial kitchen, I would not want to take on catering as a business. Although my kitchen is a nice size, three of us were still having to work around each other to chop and cook and clean. But it was fun and I’d do it again for a friend, just not for hire. 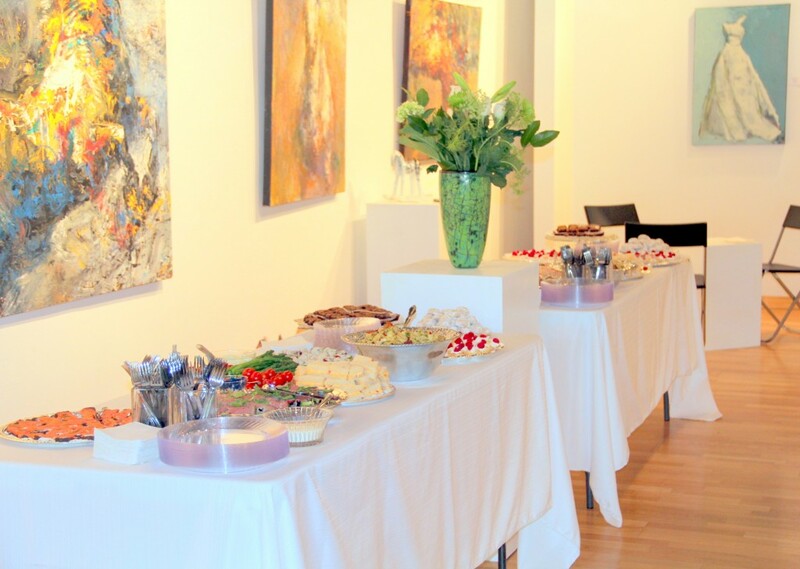 Hosting an event for 50-70 people requires good planning, lots of lists and the willingness to be flexible if some of those plans go kaput. We had our first host meeting a couple of months ago and nailed down the basic logistics: who would buy the wine and beer, who would prepare the invitations, who would plan the menu, and who would decorate. Our plans and our menu started out much larger than the final selections, but that’s a good way to go: start with a list of what you think would go great together and then pare it down to what’s manageable. 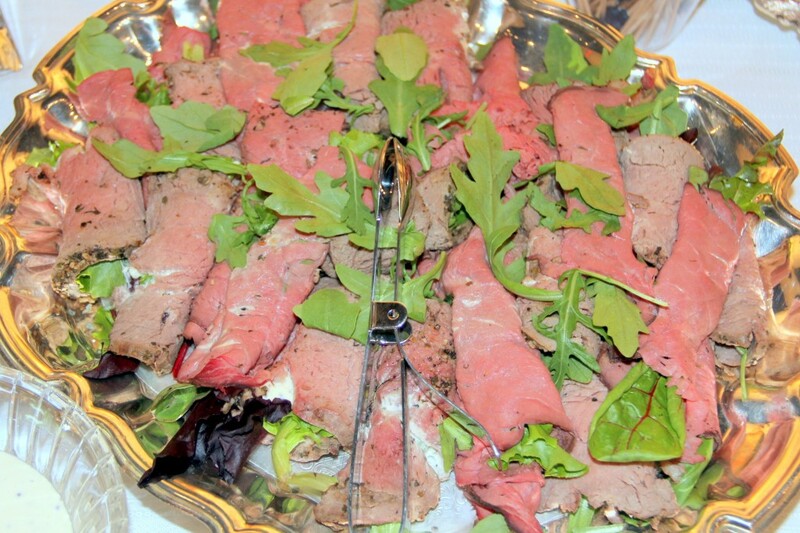 Our final menu consisted of beef tenderloin wrapped around arugula and served with horseradish cream sauce. These were intended to be easy to pick up and bite into, although I’m not sure that process worked for everyone. But they were certainly delicious. We bought a 5.2 pound whole tenderloin and roasted it and then sliced very thin. Once it was sliced, we were concerned that it wasn’t enough so we added some deli sliced roast beef mixed in with the tenderloin. It was improvisation at the last minute, but the deli roast beef blended in fine and both platters were completely empty at the end of the party. Chicken salad on crisp cucumber rounds. The cucumber lends a tangy, crunchy and different taste from the expected bread or cracker. It worked marvelously. 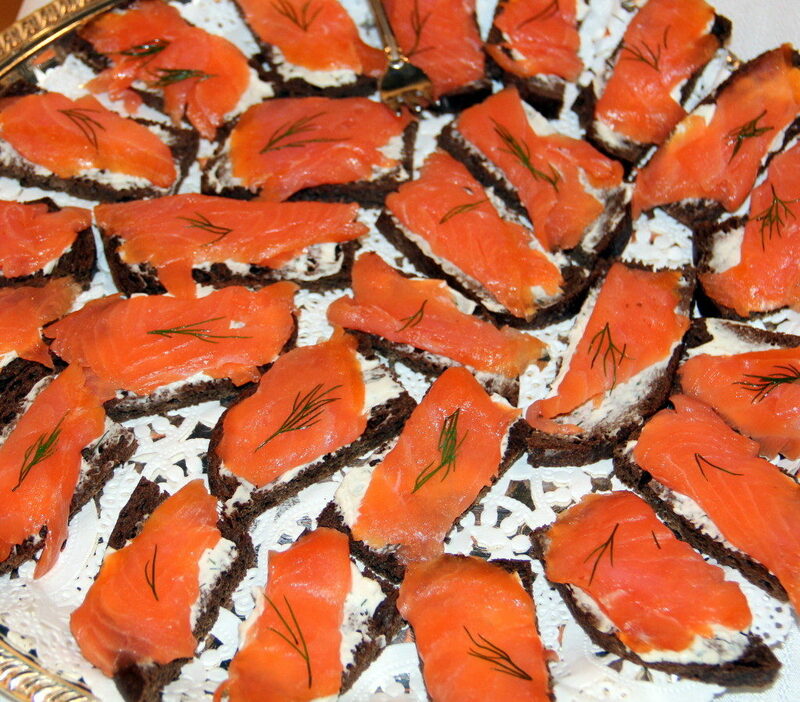 Smoked salmon on pumpernickel spread with dill cream cheese. Smoked salmon is always a crowd pleaser and the dill cream cheese took about five minutes to prepare. Vegetables with sundried tomato spread and green herb dip. We didn’t want a standard vegetable tray, so we opted for just asparagus, sugar snap peas and cherry tomatoes. The dips were outstanding, one made with cream cheese mixed with sundried tomatoes and various other tasty ingredients and the other with herbs and more cream cheese. There was a lot of cream cheese in this menu! Pimento cheese sandwiches for the bride-to-be’s father. 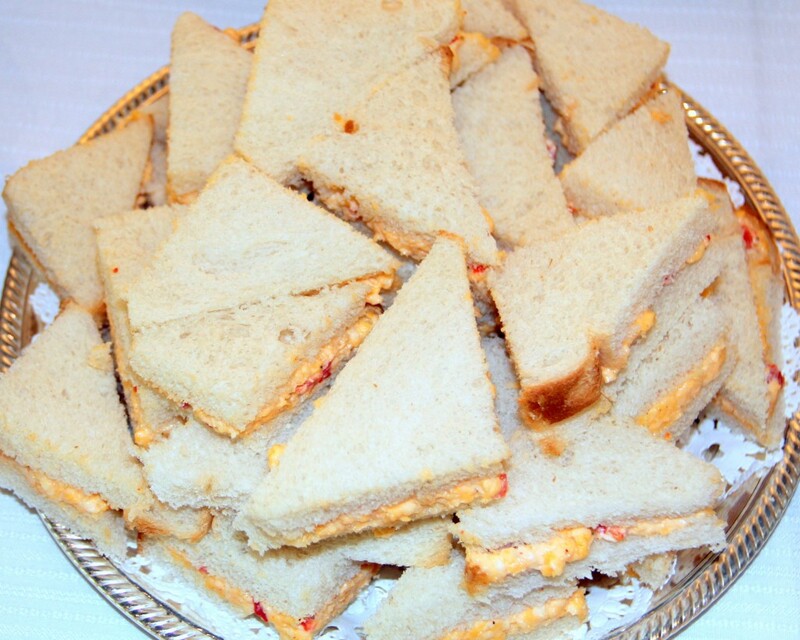 Our friend, Robbie, loves pimento cheese, so it’s a must on a menu for his daughter’s bridal shower. The original plan was to stuff cherry tomatoes with the pimento cheese, but we decided that would be too labor intensive and went for simple sandwiches instead. With the elegance of the rest of the menu, the sandwiches were a great choice and didn’t look out of place at all. Spring pasta salad with lemon pesto dressing. Oh my! The flavors in this pasta salad pop in your mouth in an amazing way. 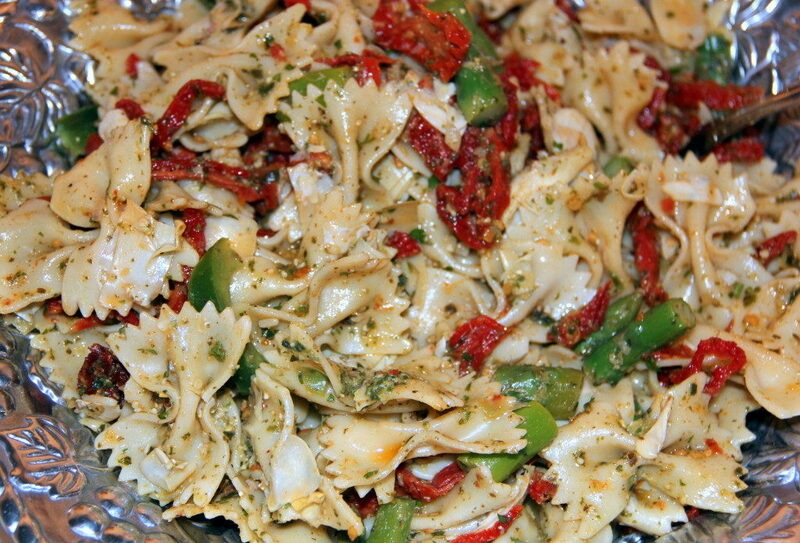 We used bowtie pasta and added sundried tomatoes, artichoke hearts, asparagus and chopped green peppers. Then we mixed basil pesto with lemon juice and zest, shallots, garlic and parsley as a dressing. Rave reviews for this one! 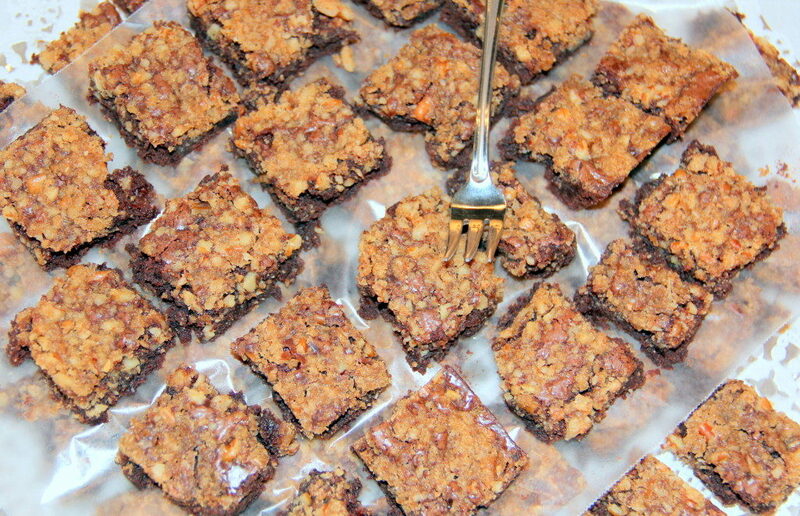 Brownies with baked streusel topping. These are Rita’s brownies and everyone absolutely loves them. The topping is brown sugar, butter and chopped pecans and it bakes right on the brownies. I gobble these brownies whenever they are near! Polvorones (or Mexican wedding cookies). 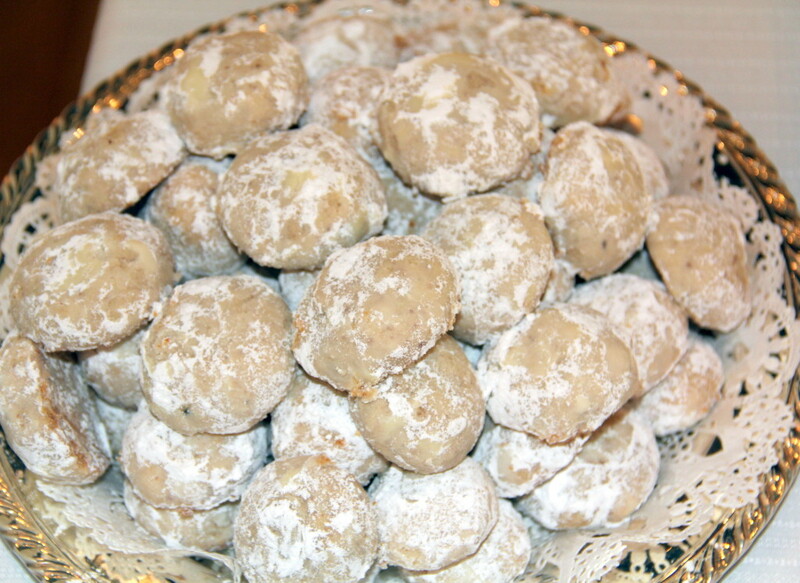 We planned to serve lemon bars, but then decided that these Mexican wedding cookies would be easier to make and to serve. These cookies literally melt in your mouth. They are full of buttery goodness, although dk of dk Gallery is probably not too happy about the sprinklings of powdered sugar on the floor. And custard tarts with whipped cream and raspberries. This was so easy — the same custard that I use for banana pudding, piped into pre-baked, frozen phyllo tart shells, then topped with a dollop of homemade whipped cream and a raspberry. Simple, yet elegant and very tasty. 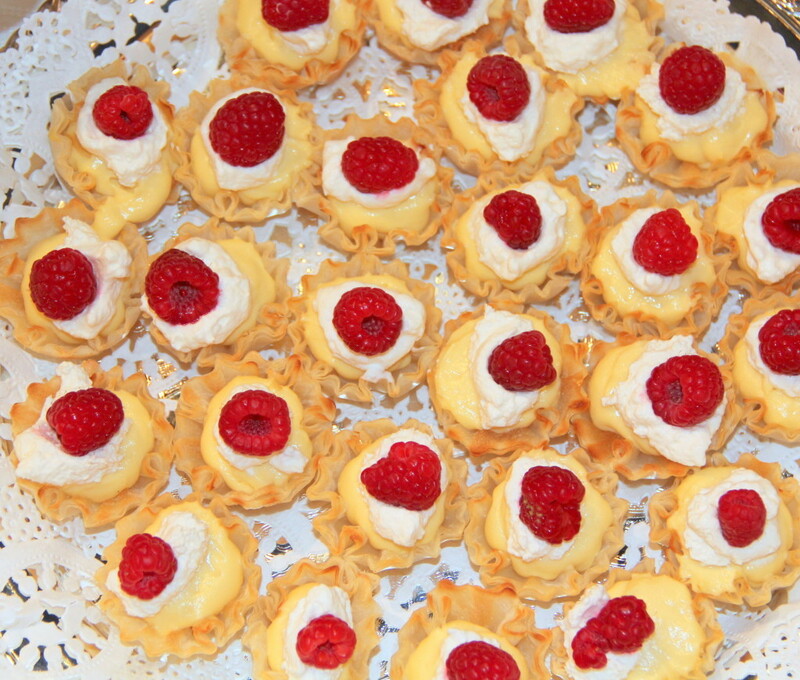 The groom-to-be’s father may have been spotted hiding extra tarts in his pockets to take home. We nixed caesar salad, lemon bars, roasted baby potatoes, oreo truffles and cupcakes, all of which were on our original menu list. 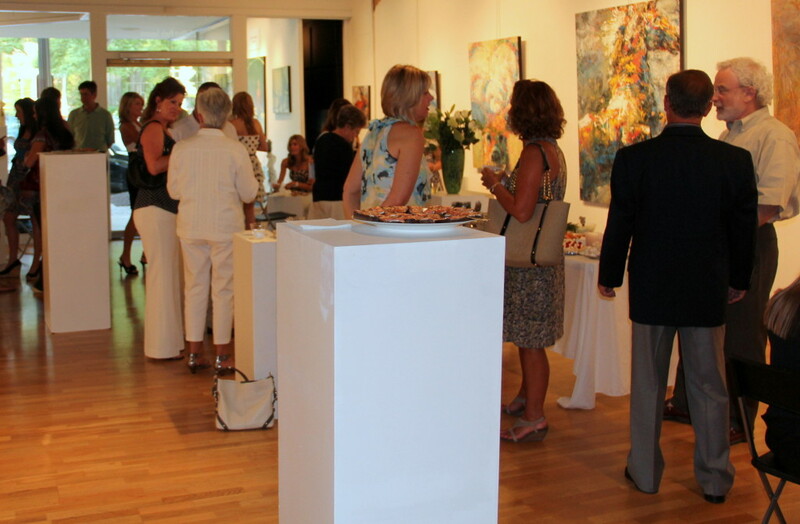 The gallery is so tastefully hung that it doesn’t require anything extra in the way of decorations. All we added were a couple of bouquets of flowers and it was perfect. Our two identical food tables were on one side of the front room, with the bar table on the opposite side. We served red wine, white wine and beer, along with spa water. We did as much as possible on Thursday so we would have time on Friday to do final preparations and then get dressed and transport everything to the gallery. First we listed out everything that needed to be done and split that list into days. 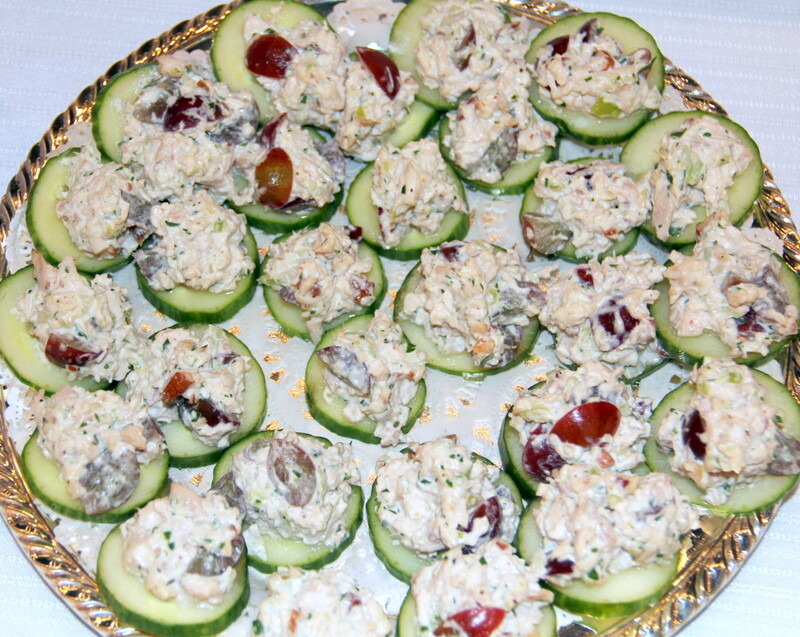 On Thursday, we made the dips, the pimento cheese, the chicken salad, the custard, the cookies and the brownies. We also chopped everything for the pasta salad. Then on Friday, we roasted the tenderloin and rolled it around arugula; blanched the asparagus for the vegetable plate (twice, since I blanched it too long the first time); cooked the pasta and made the pasta salad; sliced the cucumbers for the chicken salad; cut the bread for the pimento cheese sandwiches, and filled the tart shells with custard. Then we finished putting everything together and laid it out on the silver platters, covered the platters and set them into coolers. The gallery was set with pedestal tables and chairs scattered around, so everyone mingled and chatted and had a great time. 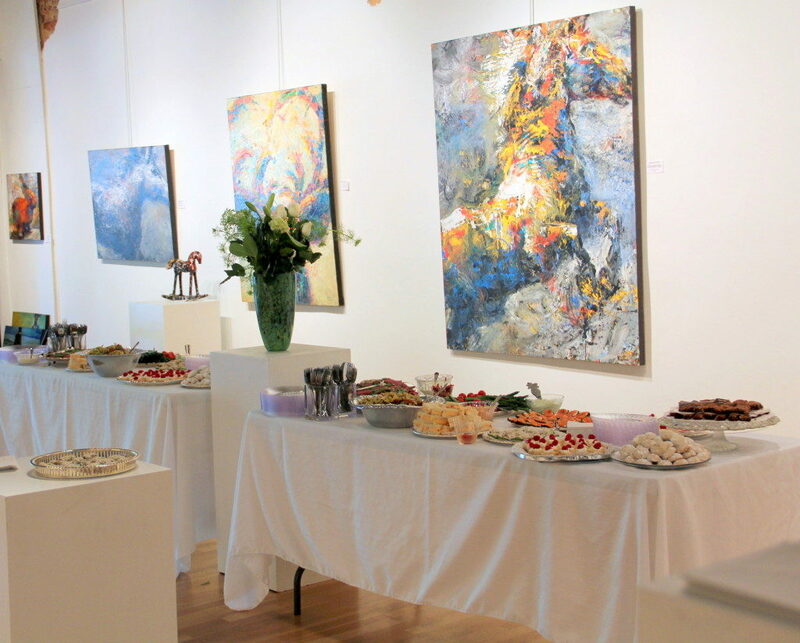 The pedestals worked perfectly for holding glasses or plates. Hosting a large shower is certainly something that should be taken on as a group effort, and four is a perfect size group. And the great thing about hosting an event with close friends is that you can all get together a couple of days later to polish off the leftovers, which is exactly what we did. 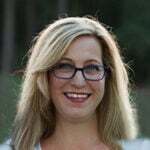 I will post all these recipes in the coming weeks — most are great dishes for summer entertaining. 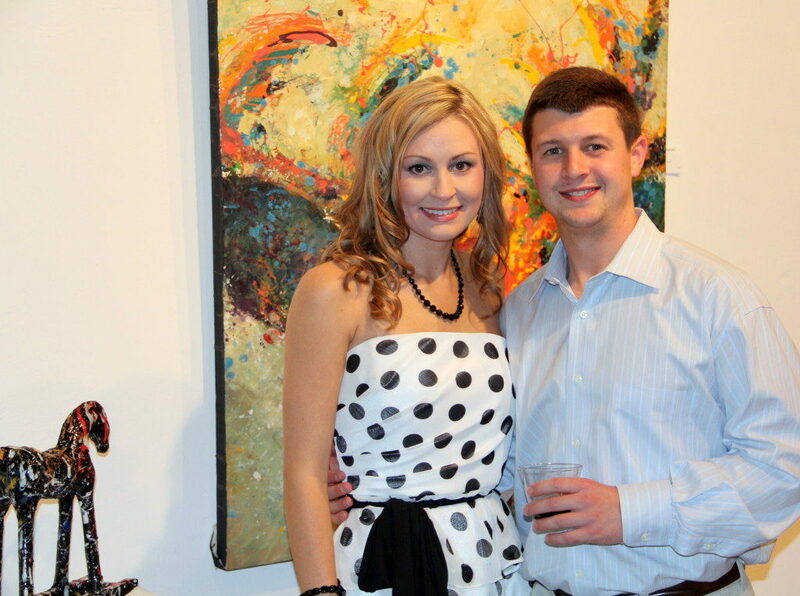 Happy Wedding, Ashley and Andrew! We enjoyed being part of your festivities.